International Journal of Research in Health Sciences,2014,2,4,1072-1079. 1-Occupational and Environmental Health Department, Faculty of Public Health, Sriwijaya University, Indralaya, INDONESIA. 2-Biological Sciences Study Program, Faculty of Science, Sriwijaya University, Indralaya, INDONESIA. 3-Public Health Nutrition Department, School of Public Health, Sriwijaya University, Indralaya, INDONESIA. Food security in Indonesia is one of the health problems due to the lack of knowledge and food producers responsibility of quality, hygiene and food safety. This study aims to analyze personal hygiene and sanitation facilities in the implementation of food stalls serving on campus. This study applied a qualitative approach. Data collection through observation and depth interview using checklist sheet and photo voice relate to the personal hygiene and sanitation facilities, according to regulation standard of Health Minister Regulation of Republic of Indonesia or Permenkes RI No. 907/Menkes/SK/VII/2003. 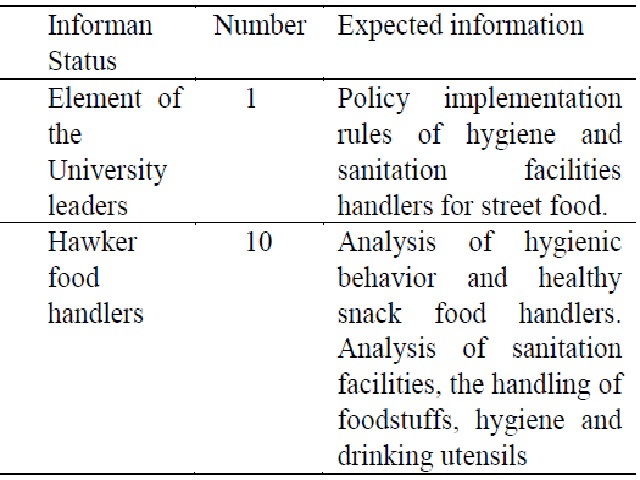 Results depicted that personal hygiene and sanitation facilities in the implementation of food stalls serving on campus observed not appropriate with the standard. Most of the informants did not use apron and hair coverings, when they process food and have of lack of practice washing hands with soap when they serving food. All informants have storage of food opened, so that the possibility of food contamination with potential hazards. All canteen, do not have garbage’s and waste disposal and facility control of flies, cockroaches and mice. The respondents do not have latrines approximately 90%. To sum up, it needed effort to do counseling, supervision and guidance about the importance of implementation personal hygiene and sanitation facilities and medical checks up for employee to improve the knowledge, health behavior and health food handlers, in order to obtain food stalls serving on campus that the standardized.